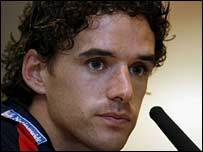 England international midfielder Owen Hargreaves has said he was surprised at coach Steve McClaren's decision to drop former captain David Beckham. Last week new coach McClaren left Beckham out of his squad to face Greece at Old Trafford on Wednesday. "I was surprised not to see him included," Bayern Munich midfielder Hargreaves told BBC Radio Five Live. "But as the manager said it is a new era and a new team and we are looking forward to the future." it would be great to receive the opportunity to play in one of the best teams in the Premier League. The 25-year-old Hargreaves was one of the few successes of England's disappointing World Cup campaign in which they were knocked out in the quarter-finals by Portugal on penalties. "The potential is still there," insisted Hargreaves. "The potential has always been there and the talent in the squad in my opinion it is second to none. "Now as the manager says it is about making a team from all the quality individuals we have." Hargreaves, who has started just 10 games in 34 appearances for England, also hinted he could play be playing in the Premier League sooner rather than later. "I'm closer than I've ever been possibly and it would be great to receive the opportunity to play in one of the best teams in the Premier League." Meanwhile new England striker Dean Ashton, 22, is confident he will be able to adjust to international football if he makes his debut against Greece at Old Trafford. "It has been a big 18 months but I have a belief in my own ability and I believe I am good enough to play at this level," said Ashton. "With Steve McClaren coming in, I knew it was a fresh start for England and if I started the season well, I might just get a call. "To get in the squad so soon is obviously a magnificent surprise. "I am a different type of striker to most who are in this squad and I would like to think I have different qualities. "I feel I can play with all the strikers here. I just want to show I am good enough."